Paying attention to simple principles can significantly improve stitching quality and productivity. One of the unique aspects of SATRA’s stitching-improvement system, SATRA VisionStitch, is that it incorporates all aspects of the sewing process from machines and motors to ergonomics and operative training. If the relevant factory personnel understood the whole stitching operation and the factors that affect the finished work, many simple changes could be introduced to improve stitching quality, increase output and, by easing the stresses on the operative, boost morale and reduce staff turnover. 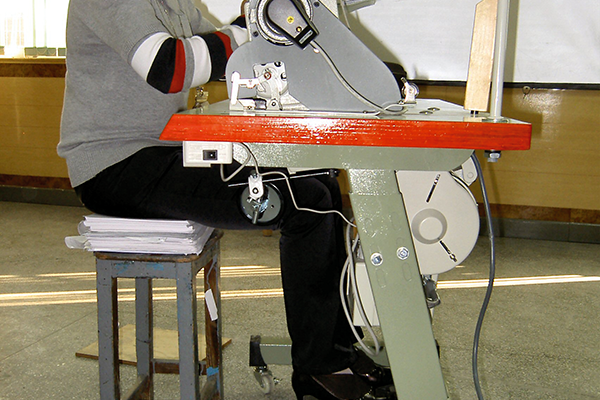 The sewing machine operator’s sitting position should enable him or her to have maximum control over the machine and the work in progress. This will involve consideration of the chair position, the foot pedal, the knee lift and the bench itself. To achieve the correct sitting position, it may be necessary to move the controls of the machine. In many cases, we find that there is little or no adjustment available, causing major problems for mechanics. Therefore, when purchasing stitching machines, it is essential to consider what adjustments are available on the machines (see figures 1a and 1b). speed settings of motor (including maximum). If the operator cannot easily and effectively control the stitching machine, he or she will not be able to perform adequately and the benefits of any new equipment will be lost. Training may also be needed to teach the operator how to use the new machine correctly and help mechanics to learn how to maintain and adjust it. 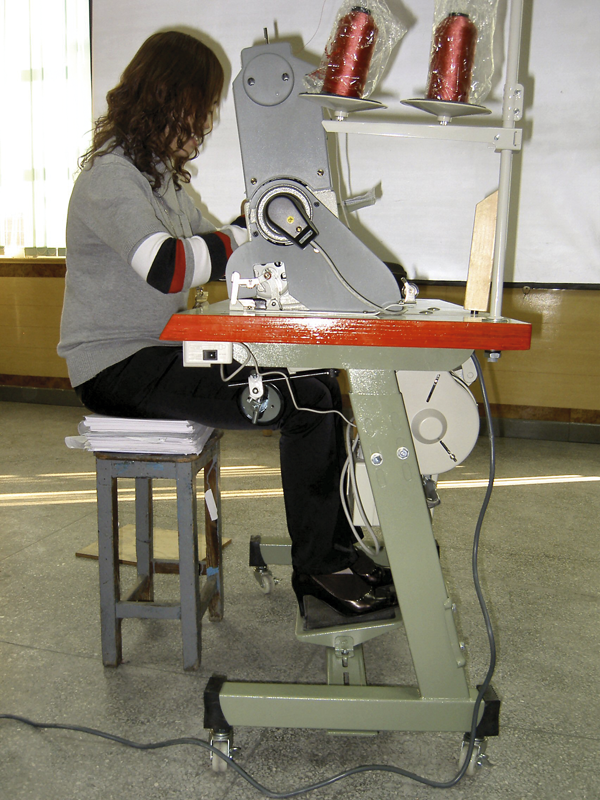 Figures 1a and 1b show that when the pedal, chair and knee lift are adjusted correctly, the operator assumes the optimum sitting position. Figure 1a shows the initial unsatisfactory position and figure 1b shows a stack of paper being used as a guide in a SATRA training session, to indicate how much the seat will need to be adjusted to achieve the correct sitting position. It is essential when purchasing new stitching machines to specify to the supplier what adjustments are required. The specification should cover the bench itself and all the controls, detailing where adjustments will be required. The type of motor also needs to be specified – for simple stitching paths, the lower cost traditional clutch motors may be adequate. For more complex paths, the higher cost electronic motor may work out more cost-effective for productivity and quality. If both types are present in the factory, the SATRA VisionStitch system can be used to select the most appropriate motor for a specific job. The ability to adjust the operative’s sitting position and machine settings can also help when changing from one style to another. Quickly setting the motor configuration to match each style introduced will result in fewer quality problems, a reduced change-over time, and potential to reach full production speed more quickly. Machine breakdowns are clearly highly disruptive to the stitching room output. Setting the machine speed to the optimum, which is rarely the highest speed available and often less than 1,000 rpm (revolutions per minute), will result in less wear on the machine and less risk of machine breakdown. Furthermore, if the operator is sitting at the machine correctly, the chance of him or her becoming fatigued and making errors will also be reduced. As well as adjusting the machines, there may be other aspects which, although not directly involved in the stitching operation, can seriously affect machine operation. A common example of this is the size and placement of the oil drip tray beneath the stitching machine. When the controls and chair are in the original incorrect position, the drip tray is no problem. However, when the chair and pedals are correctly adjusted, the drip tray makes it impossible for the operative to use the machine (see figure 2). Fortunately, this simple part can easily be changed. Factory mechanics are often able to modify such attachments to reduce their effects. Once the correct settings for the machine have been established, new operatives can be trained. Setting the correct sitting position and most appropriate working speed will provide new operators with more control, making them more receptive to the training methods, which in turn increases confidence and minimises mistakes. Email systems@satra.com for further details or to arrange a demonstration of SATRA VisionStitch in your sewing room.